You must make reservations at least 5 minutes in advance of the time at Faded bistro and Beer Garden. Locals & visitors alike embrace and crave this unique approach to dining out -- some may consider Faded Bistro & Beer Garden a second home, a place where they're comfortable, that they want to share with friends. The cuisine ranges from a Bistro Lunch menu featuring flatbreads, quiche and Certified Black Angus burgers made with the Faded specialty blend to a Dinner Menu that features various Tapas, charcuterie boards, fresh seafood and Certified Black Angus Beef and chops. We take pride in using the freshest, locally sourced ingredients all the way down to the cup–brewing small-batch roasted coffee from Bones Coffee located in Cape Coral, Florida. Choose a table or cozy nook under the warm glow of our lanterns or grab a table in Beer Garden. The restaurant is located in the heart of Downtown Sebring and is easily accessible with street parking as well as a large onsite parking lot. We look forward to welcoming you and invite you to relax and stay awhile. A hidden gem! The food is fresh and fabulous. We sat outside in the patio and felt like we were in the middle of no where in a beautiful oasis. Truly the best food and drinks in the Avon Park/Sebring area. Dh and I were visiting his brother and wife in Avon Park. As a thank you for their hospitality, we wanted to treat them to a special dinner out. I found this listing at Open Table. It sounded perfect and I made reservations. Highly recommend you do also. We had a bit of trouble finding it, but we did and parked. We were met by hostess and seated immediately. Unfortunately, it was at a high top with stools. We asked for another table but although they were empty, she said they were reserved. She went and found some bar stools for us and that was fine. Make you sure mention this in reservation if this is a concern to you. The setting is magical! They have misting fans going and it was perfect out. Our server was Sydney. She was delightful and took very good care of us. We started with drinks. Dh had a extra dirty martini and said it was good. We had sodas. We ordered out starters. They all looked great! After some deliberation we decided on the marinated olives and two orders of calamari. They came out in a timely fashion and we dug in. The sauce was just right and the calamari was so fresh and sweet! The olives were a varied selection. That was polished off very quickly. I ordered the Indian Chicken Curry spicy and it was just perfect. Oddly the unseasoned chicken was laid in strips across the dish and there was no garnish of cilantro. My fellow diners had the Parmesan Pork Loin. It was served with Asparagus. The serving of meat was most impressive! They made short order of that and we all joined the clean plate club! Our only glitch of the night was our dessert. We started to swoon when we were told there was Bread Pudding for dessert. We got two to share. I was actually puzzled what it was when it was delivered. It was cold scoops of bread pudding. No creme anglaise or any sauce over it. It tasted ok but was a letdown after such a superior dinner. I would come back any time I travel back to that area. I recommend it highly. Faded has great ambiance. Beautiful garden and music playing. Quiche was delicious. Homemade salsa and chips delicious. Turkey sandwich amazing. The lamb chops were overpriced for the product I got. The chops were quite thin. Didn’t care for the couscous. My wife got the zucchini spaghetti dish and it was very spicy and too much sauce. Otherwise nice ambiance. We were a group of 7 from the Avon Park First United Methodist Church and we ordered 4 different items from the menu. All 7 found their choice wonderful, and the price what you would expect at this type of establishment. I was disappointed in the size of the piece of cake for the price. I purchased 2 pieces of cake with a lemon topping to share with the group. The cake was cut in a pie shape, about 2 inches wide by about 3 to 3 1/2 inches long, for $8.00 per piece. A piece of 4 layer, chocolate or carrot cake, which serves 6 to 8 people easily, costs $8.95 at Cody's, which seems reasonable to me. When I come next time, I would not be inclined to purchase dessert again, unless the price is adjusted to the size of the dessert. It was our first time there and we will definately be coming back. Best restaurant in Sebring! Excellent food! We both had peppered tenderloin , it was gork tender and so much flavor ! I’ve been before and loved it, but didn’t realize that Sunday has a different menu. I am vegan and gluten free, so eating out is a challenge and Faded has come through for me in the past. Not this time, though! They had nothing- not even a side salad. Luckily, I had a protein bar in the car which I ate at the table. I think a restaurant that offers plant based food should always have at least one thing to offer on every menu. We arrived 45 minutes before they closed and everyone seemed to be in a big hurry to close up quickly. The other three guests were not impressed with their selections. They said they tasted good but we’re served absolutely plain. The portions were small - no leftovers today! I hope this does not mark a permanent change for this restaurant which has been delightful in the past. A side note - I checked the online menu before I reserved to make sure there was something I could eat and there was no mention of a special Sunday menu. Fabulous restaurant. My husband and I had a great date night! Even when a strong thunderstorm started they accommodated everyone who was outside and were very attentive to everyone’s needs. We think this is the best restaurant in Sebring and we really like the ambiance. Service can be a little lacking at times. This trip our server didn’t know the specifics of the daily specials, that’s really a no-no for a good restaurant. Faded never disappoints. The best restaurant in Sebring ... I am disappointed that we weren’t able to visit often this winter but will definitely correct that next fall. The caprese salad was perfect and the mahi special was exceptional. The pork tacos on the small plates menu are simply the best anywhere. And, how about $3 glasses of wine on Wednesday until 7 pm? Now that’s a no brainer. Thank you Bob and Tiffany for continuing to make your business one if the best in the city! This jewel is so not the typical Sebring eating experience! It was recommended by a friend and we had a wonderful evening. The food was well prepared and with generous servings. The staff was friendly and knowledgeable. We'll be going back! Fantastic place. Great food and nice ambiance. Great wait staff and selection of beer, wine and drinks. We had the Fish special and steak. It was wonderful. The garden is so relaxing. Food was excellent and the server was prompt, friendly and cute! Best restaurant in Sebring. A breath o fresh air for the village. This place is absolutely fantastic. I had the short ribs and cheese plate for starters. The stuffed pork chop and Tuna Poke were awesome. Beyond the food, the drinks were all excellent with a good selection of craft beers. The staff was extremely friendly, and quick. They let us enjoy dinner while keeping a close eye on the drinks etc. Sydney keep a close eye on everything and made many real good recommendations. I'd recommend asking for Sydney..
We enjoyed the chicken liver pate, which was excellent. The Shrimp Caribbean was very flavorful. The steaks were a bit tough. Our server, Sydney, was superb in every way. This was our first dinner visit. Perfect evening. Breezy and pleasant dining venue. The menu was classy and the execution of flavors was sophisticated in every way. We enjoyed everything about this place. Our server was the best. This will be a go-to for our future fine dining. Our food was luke warm when they brought it out and we were there an hour and 30 minutes before our food came out. It was like our food was sitting in the window awhile before it came out. I would recommend more of a team approach. We saw one waitress just walking around. I don’t know if I’ll go at 8pm on a Friday again. Met with family for a reunion. Nice setting with lots of fresh air and beautiful gardens. Food and service good. Would go again if in area. Go there! Nothing like it in Highlands County. Laid back sophistication and great atmosphere! Love it! The food and the atmosphere are consistently spectacular! There is a great ambience no matter where you sit, greenery, fountains, always something lovely to view. Service was outstanding!! The champagne was perfectly chilled and the food was delicious!!! The lamb chops were delicious with the seasoned couscous and stemmed cauliflower dressed with lemon seasoning. Spouse had red snapper with a delicious sauce. Friend had the Buddha Bowl. A cold pasta dish with a variety of veggies including zucchini noodles dressed with a very flavorful dressing. Her husband had chicken and pasta and he loved it. The waitress was great. She worked hard to accommodate us as we were in a hurry to get to a concert. Very good overall experience. The ambience was lovely. The service was fine. The meal size was wanting, however. We were a group of four. All four dishes that we chose from the Sunday brunch menu turned out to be far too small to justify the cost. We would suggest that you include some sides in your brunch dishes, so that patrons are left feeling satisfied with their meal. We would try the restaurant again on a day other than Sunday, but would definitely not return for the Sunday brunch or recommend that particular meal at Faded Bistro. Very unique place. Many unique items on the menus. Had dinner one evening and lunch the next day. Would recommend to anyone. Really nice outdoor setting. Good drinks and good food. Great start to a girls night out. We were impressed from the moment we were greeted by several employees. They seemed to know who we were from the get go. Wait staff was attentive and engaging. Food was spot on. The entertainment was perfect. We were concerned about the noise b/c we were seated by the band and had an elderly recent stroke patient with us but even the band seemed to accommodate our group of 8 by turning it down a notch (and they were very good, by the way!) The ambience/atmosphere is very bohemian and the outdoor seating was perfect- just enough sun and shade. It was a perfect dining experience. Faded never dissappoints. 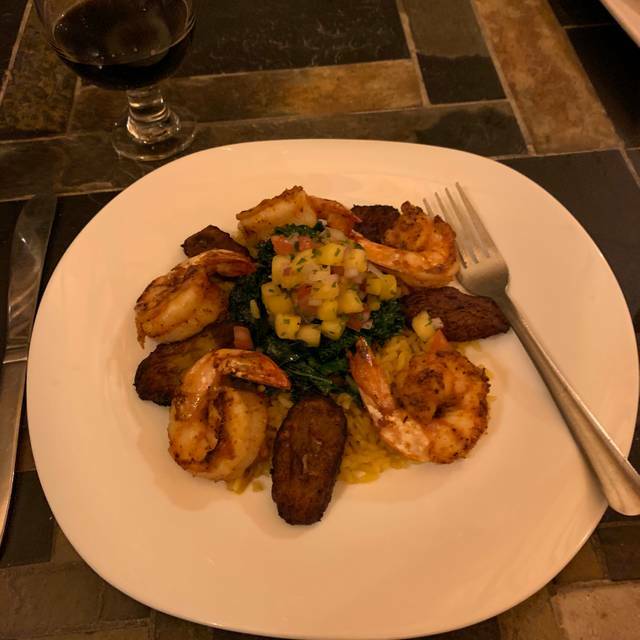 Three of our group of six had the Shrimp Caribbean and raved about it. The short ribs were excellent as was the beef tenderloin ... I had the pork tacos and they were delicious (three very generous tacos were plenty for an entreé). Good service, great entertainment which was at a realistic level so conversation was easy and you could enjoy the music. Great job! Beautiful magical spot. Food was delicious. The kitchen was a little slow but again food yummy when it arrived. It is right on the main drag so there was some road noise. I would highly recommend. This is a go to place for us on a weekly basis and any time we have family or friends from out of town, this is where we take them! Great service. And the valentines special of baked branzino was magnificent. Excellent attentive, but not intrusive service. Only thing we can fault them on is that they ran out of decaf coffee! Valentines Day was my first visit and we were not disappointed! The garden area is so charming! The live entertainment, lights and fire pit/heaters create an inviting space to hang out and enjoy the surroundings. The seating inside is very spacious with just enough room between tables to give patrons privacy. Our waitress had a very sunny disposition and engaged in friendly banter as our party explored the menu and drink offerings. When asked if substitutions were available she inquired with kitchen staff and promptly reported back with options. The food and drinks were AWESOME! Everyone in our party ordered something different, but the favorite meal was the Angus beef 5 oz. tenderloin w/lobster mac & cheese. WOW! We will be back! Can't wait to visit during lunch and eating out in the garden area.